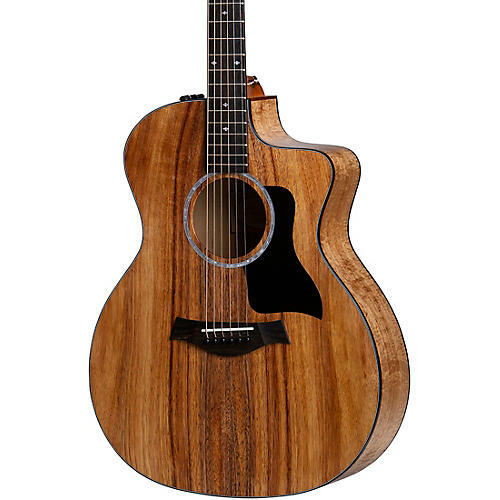 Taylor's 200 Deluxe Series, which includes this 224ce-K DLX Special Edition Grand Auditorium acoustic-electric guitar, delivers all the essentials of a great guitar - exquisite playability, a full and articulate voice, impeccable intonation up the neck, and Taylor's top-of-the-line, professional-grade pickup - at a price that's within reach of many. This collection strikes a sweet balance between tasteful design constraint and aesthetic variety, bringing Taylor's signature tonal clarity and playability into a stage-worthy mix of guitar options. Like all 200 Deluxe Series guitars, the 224ce-K DLX Special Edition Grand Auditorium acoustic-electric ships in a deluxe hardshell case made by Taylor for optimal fit and protection. A guitar's top is the primary filter and distributor of vibrating string energy through the guitar, which means it has a huge impact on its sound. Solid Hawaiian koa is a hardwood that produces a natural compression, yielding more of a controlled "roll-in" effect to a note. The compression evens out a lively attack for a more balanced response. It delivers strong fundamentals with clear and direct focus - similar to mahogany - but with extra top-end shimmer and chime. Layered Hawaiian Koa back and sides create a visually appealing and complementary platform for the vibrating string energy sent by the guitar's top. Layered wood is less susceptible to changes in temperature and humidity, making it an excellent choice for players who travel with their instruments or simply require more durability. What sets Taylor Guitars apart? Unmatched build quality, the most stable and playable necks, a vast array of tonal options, eco- conscious and ethically-sourced raw materials, and a lifetime of service and support.